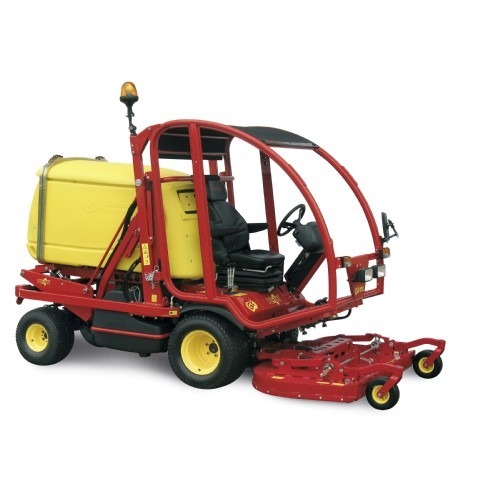 The Gianni Ferrari Turbo 4 is a compact machine that is designed for extreme commercial use like strong slops and very large areas. The revolutionary patented mower deck fitted to the Turbo 4 has a large collection capacity that does not clog even when cutting long wet grass, giving a quality cut similar to that obtained with cylinder blades. Tthe blades turn in the opposite direction compared to traditional mower decks. This rotation reversal has surprisingly positive results on cutting quality and collection efficiency. the double blades prevent the accumulation of grass and dirt in the upper part of the deck, always giving a perfect cut and collection. The floating action of the mower deck copes with the most difficult cutting conditions even on uneven surfaces. The hydraulic lift of the deck to the vertical position enables easy access to the bottom of the mower deck, so that maintenance such as blade changing and cleaning are made easy. Turbo 4 can cut and collect grass, together with leaves, waste papers, tins, plastic bottles. Etc…, at a rate of 5.000 to 15.000 sq.m/hour with perfect cutting and collecting quality. The intake hose connecting the mower deck to the fan is made of strong steel instead of plastic for long life. The large powerful vacuum fan has a diametre of 360 mm producing a high input of air at low rpm resulting in low noise level. The vacuum fan is equipped with 6 articulated blades that are easily changed in case of damage or wear. The grasscatcher container is made of high resistance polyethylene equipped with a filter, a back door, a chute and buzzer warning when the container is full. The grass filter is composed of easily removable metal mesh with plastic protection reducing cleaning time. The rear door automatically opens when the grasscatcher is tipped. An efficient and strong grasscatcher high dump up to 220 cm. (option) allows the operator to easily and rapidly discharge the cut grass directly into a truck or a trailer. All these features drastically reduce your cutting and tipping time. An aluminum dump body can equip the mower without the collection system, and be very useful for transport of sand, clay or other material. Since this is a highly professional machine, intended for extended use during day time, particular attention has been paid to the operator’s seat and control ergonomics to give the driver maximum comfort and safety. The controls for the engine, the blade engagement and the hydraulic devices (deck lift, grasscatcher emptying and lifting) are all located near the operator’s right hand and are all easily accessible. Warning lights and levl gauges are located on the steering wheel support column. The fully adjustable steering wheel always allows the correct drive position to be achieved by the operator and it is extremely comfortable. Access to the seat is unhindered as there are no obstacles between the steering wheel, seat and foot-platform. The foot-platform is mounted on anti-vibrating damper brackets and is fully adjustable to the vertical position allowing the mower deck to be as well set in the vertical position. The seat is adjustable in various positions for better comfort. If requested is available an heated seat model. The double hydrostatic transmission is provided by a system composed of a variable capacity hydraulic pump with powerful drive that controls two hydraulic motors, one per axle. Each hydraulic motor is installed on a differential gear connecting two gear drives in an oil bath that transmits motion to the wheels. The system is fixed on a strong chassis made of highly resistant steel. The system is extremely safe and powerful, and enables the machine to easily climb the most difficult slopes. The differential gear on the front axle is equipped with a differential lock to further improve the traction of the machine. The rear drive axle differentiates itself from traditional steering wheels axles by the absence of a steering universal joint, allowing a tighter steering angle. A further patented device that increases the steering angle comprises an automatic proportional release of the front axle. Due to this automatic release the machine can steer with an internal radius on the front wheel of only 70 cm. The machine has an extremely low centre of gravity enabling it to go across a slope without the fear of tipping over. It offers a complete driver protection in case of the machine roll over. The structure comes complete with safety belts. It is foldable downwards to make the machine loading easier in particularly low passages. The liftable structure for an easy maintenance comes complete with lighting kit, safety belts and a sun roof. It can be completed with front windscreen and doors. These machines have been designed and built with the aim of safety and reliability in every working condition. The machine and relevant equipment have been subjected to various tests and checks provided by the EEC regulations for safety, noise, vibrations and electromagnetic emissions. Several devices have been installed on the machine to ensure maximum safety.